It’s never too early to start fostering a deep, almost obsessive love of Star Trek in your children. 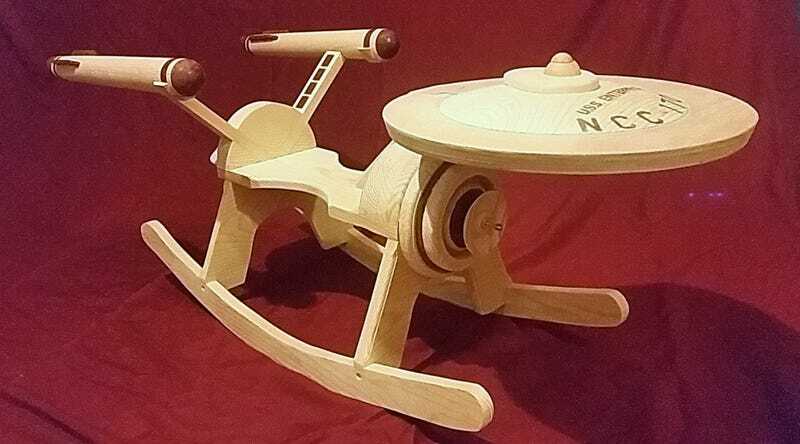 So while your toddler is innocently rocking back and forth in this lovely wooden USS Enterprise rocking horse, they’ll have no idea they’re secretly being groomed as a future Trekkie. Available from Etsy seller GandGRockers for $195, there’s some wonderful detailing on this miniature version of the Enterprise including warp engine nacelles, a tiny deflector dish beneath the saucer section, and the ship’s call sign branded on top of it. The only reason not to order one before they sell out is that this Starfleet ship can only accommodate a single crew member, and they can be no larger than a five-year-old. So don’t even think about trying to beam aboard.